The Sincom 32E Synthetic Compressor Oil is an original Silentaire compressor oil from the manufacturer. This oil comes with all oil-lubricated Silentaire compressors featuring refrigerant-based pumps. And what’s more, the Sincom 32E compressor oil can be also used with most silenced air compressors of other brands employing refrigeration type motors. For one thing, the Sincom 32E Roloil offers an optimal lubrication both for Silentaire air compressors and other brands using refrigeration systems in compressors. 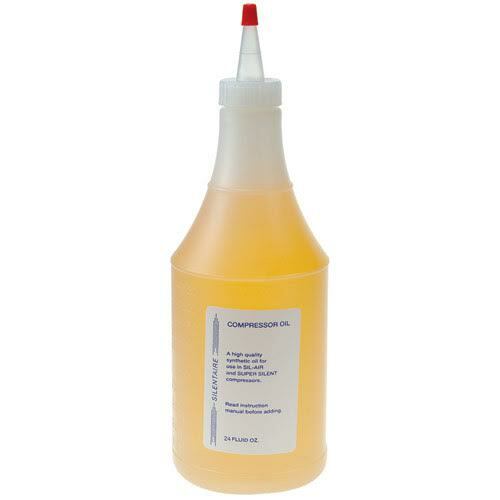 For another, this synthetic compressor oil serves as a lubricant and a cooling agent. In addition to that, the oil works well even with high temperatures up to 220°C. For this purpose, its composition includes antioxidant and antifoam additives that are specifically tailored to ensure excellent performance of the most powerful air compressors. Please pay attention that new air compressors are out of oil for the sake of safety and integrity of equipment during transport. In order to add the oil to the compressor, follow the steps below. Find the rubber plug on the intake pipe and remove it. Then, you need to remove the air filter and the spout from the plastic bag. After that, screw the spout on the oil bottle. If your compressor has a 15 or 30 motor type pour the oil through the side pipe or if your compressor motor type is 50 then add oil through the oil charging hole on the cover. The oil must reach a level according to the requirements specified on the label. Take note that the oil must not exceed the max level. The remaining oil can be used in the future for replenishing. Once you add the oil, put the intake filter back on the pipe or in the hole. To prevent oil from running out, do not turn over or tilt the air compressor. For the better performance of your Silentaire compressor, we recommend you change the Sincom 32E compressor oil at least once a year. Use the oil only specified by the manufacturer. Otherwise, all guarantees will be voided.